"I must tell the world what is happening there"
Fortunately, our team members met and talked with two Eritreans who came to the United States recently. One of the individuals has shared with us how conditions are in the countryside, as well as in Asmara. For the safety of the innocent, his name and certain other particulars are not included. His replies to our questions follow. The America Team met and interviewed a man who left Eritrea in late 2008 and came to the US in February, 2009. The following is an eye-witness account of what he has seen in Eritrea. Where were you living in Eritrea? In Asmara, though I was sometimes able to get out to the countryside. We hear of scarcity and inflation in Eritrea these days – how was it when you left? Everything in Asmara is very expensive. You can get most things if you are able to pay a very high price. What is an example of pricing in Asmara? Well, of the common grain crops (teff, wheat, sorghum and millet), for example, millet was the cheapest, at about 5,000 Nakfa [US$ 335] for 100 kilos [220 lb.]. This was more than many people could pay. And grain was not always in good supply. What about outside of Asmara – what did you see there? I visited several towns late last year, and it was a much different story. I saw many cases of malnutrition and starvation. And the people in Asmara are aware of it. What is causing the starvation? The government is keeping food from the people. While there already was not much food available, it is illegal to send crops out from Asmara to the towns. There were checkpoints along the road to loojkfor grains, for example, and people told me that soldiers searched houses to make sure that grain was not being stored there. You cannot buy and sell things in the towns, because the government has closed the stores. I saw some people forced to smuggle grain out of Asmara to the towns so that their families would not starve. How was transportation to the towns? There are now no more busses to many of the towns. To leave Asmara, you have to have a special permission pass that will be allowed only if you have a very important reason such as going to a funeral of a familiy member, and a fuel permit is needed too, to have someone drive you. To apply for a permission pass, it takes many hours, because no one wants to take the responsibility of issuing it, and you are sent to different offices. Then you have to pay the driver – once, I had to pay 2,500 Nakfa [US$ 166] for a trip of only 100 km. Getting back to question of hunger, are things really that bad? Yes, things are really terrible – I spoke with many, many people who all said that they just don’t have any food, and that corps grown were taken by the soldiers. I saw young children that were so weak from hunger that they could not walk or talk. When bread was provided, I was told with no exaggeration whether 5 or 10 in a family they were given only 2 pieces of bread, which doesn’t feed 1 child. People in jail were punished by starvation. People told me how the military junta treat them like animals. Places I saw have no food, medication, transportation; and electric and telephone service are very limited. People do not demonstrate – whoever tries to organize is tortured or shot. To speak for your people is death. The people in the countryside are treated much, much worse than the people in Asmara – it is like only the Asmara people are Eritrea – the others on the outside are no more than dirt. But many in Asmara are suffering, too – especially knowing what is being done to their brothers outside of the view of the world. I must tell the world what is happening there – before it is too late. I owe it to my friends and family, to my country and to mankind. That is so sad – thank you for sharing what you have seen. 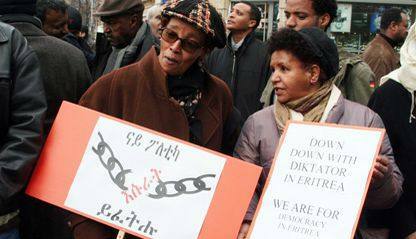 The America Team for Freedom for Eritrea: An Eye Witness from Eritrea, Interview #2. 16. Februar 2009. http://www.freeeritrea.org/files/EyeWitnessReport-2A.pdf.